Andy, you are a one man group build! Prolific I think the word is. oh yeah thats right those are exactly the words i was looking for. And hope to see more your battyness. Andy: The Wildcats looks really cute, but since good microscopes are heavy investments I'll wait a bit with trying 1:144. I have also seen that my brushes and tweezers seem to shake allready in the toolbox, so I stick to 1:48. Now I've got my camera running again. Seems like it was a Microsoftish problem. (Turn off, leave in peace, turn on, voila) This is the situation so far. Even if the shades on this one are soft, it really feels colourful. I might have got the blue a bit thin on the fuselage, but hope that markings and wheatering will blend the shades together in the end. I tried to spray in a narrow angle on the larger surfaces, and also from different directions, so the surfaces got more layers of paint than the panel lines, and it looks like it worked. The lines are darker than the preshading that shines through around them. Next step is a gloss coat, and then decals. It's a mighty sheet of stencils, compared to the Monogram G-14 I did a while ago. We'll se if I can get through that without breaking down. "I really like this jacket, but the sleeves are much too long" Ian Kilmister. Blimey,,I turn my back for a day or two and there are builds coming from all directions! Some great work going on here, and welcome to the new enlistees. Im pretty much relegated to watching from the sidelines,( or to be more accurate from the side of the stage) at the moment as life has got in the way and Im back on tour. We are now up to 49 potential Aces. hope it reaches 50! At least I managed to throw some Alclad at the underside of my P47 before I left, so Im not feeling too bad. 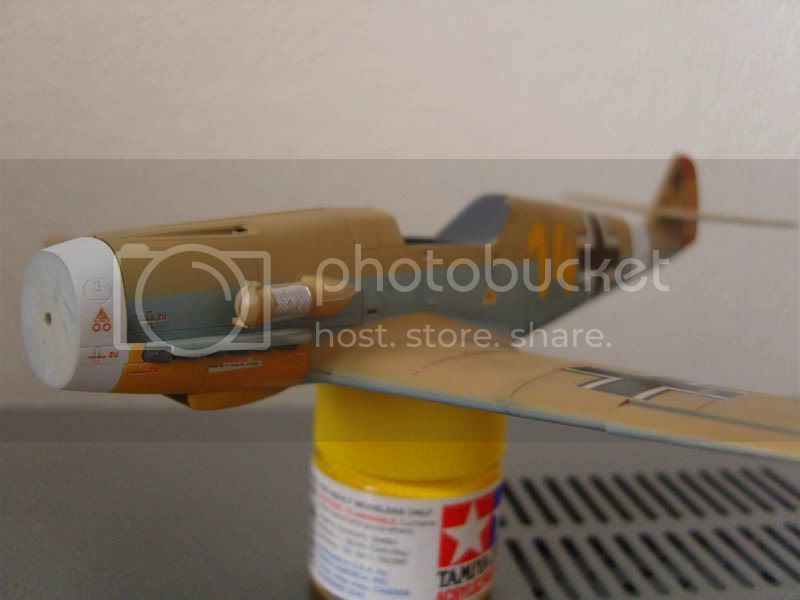 I've made a start on my entry as well, Academy's 1:72 scale Bf-109 G6, which I'll be painting as the Finnish MT-437, flown by m.sgt Leo Ahokas, an ace of twelve aerial victories, five of which he achieved flying Messerschmitts. ^ Here's a detailed list of victories and losses of Fighter Squadron 24. It in Finnish Wikipedia, but reading it doesn't require Finnish language skills. The first table has victories from the Winter War, and the second from Continuation war. 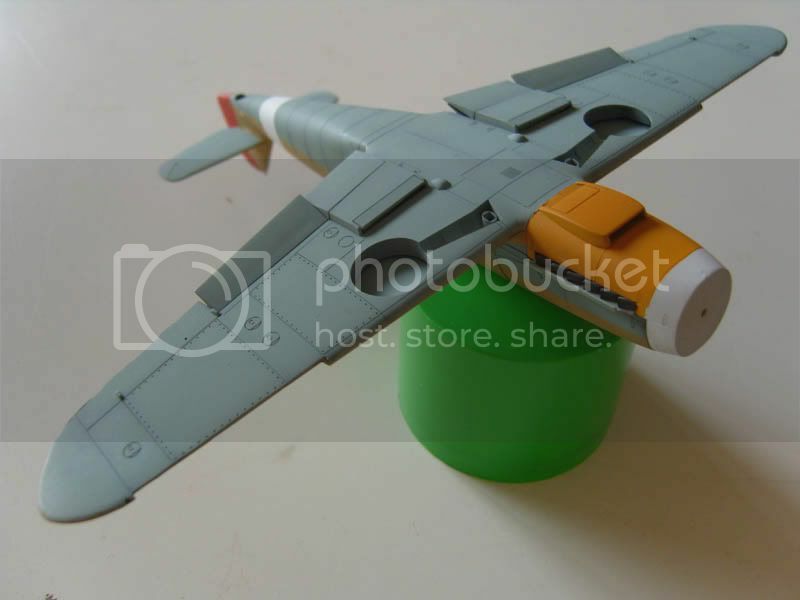 As usual with PE sets, the sidewall cockpit details had to be removed from the fuselage halves. With this kit, the front cockpit floor locator had to go, but fortunately the parts fit just fine with the rear ones alone. 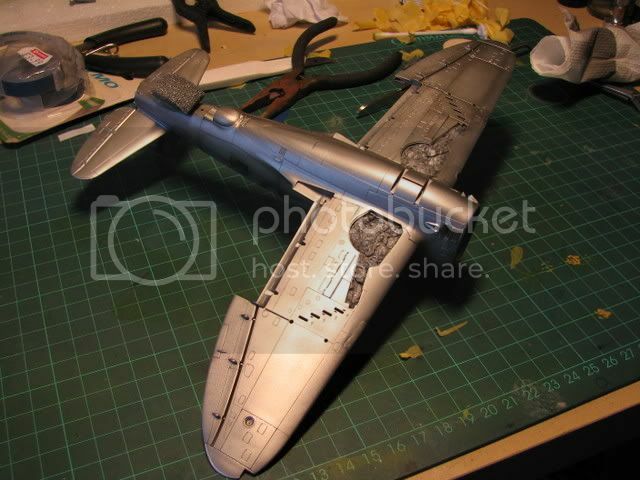 Here the most of the cockpit sidewall details have been added and the fuselage halves are almost ready for priming. Some of the pre-painted parts I'm leaving until the rest is in RLM66, some I'm painting over, for example the numerous boxes and the throttle. Folding them removes the paint from the edges (at least when I haven't varnished them in this case), and touch-ups would be tricky. Here's the wheels with PE parts added, the engine supercharger air intake stll in progress and the resin exhausts with one kit-part for comparison. Most of the tires used on Finnish 109s were apparently of the smooth-tired variety made in Finland, so I may have to work them with milliput or resort to buying aftermarket parts. The exhausts are originally meant for Finemolds kits, but they can be used on this kit with minimal modification. I had to replace the "base" of the exhausts with plastic card because I slightly messed up the cutting and sanding of them. The kit supercharger intake is modified by first scraping the edges of the parts, to make a groove in the assembled component. To this groove I superglued strecthed sprue to depict the seam. The opening was too large, so I filled it with milliput, with the intention of drilling a new better hole in there. 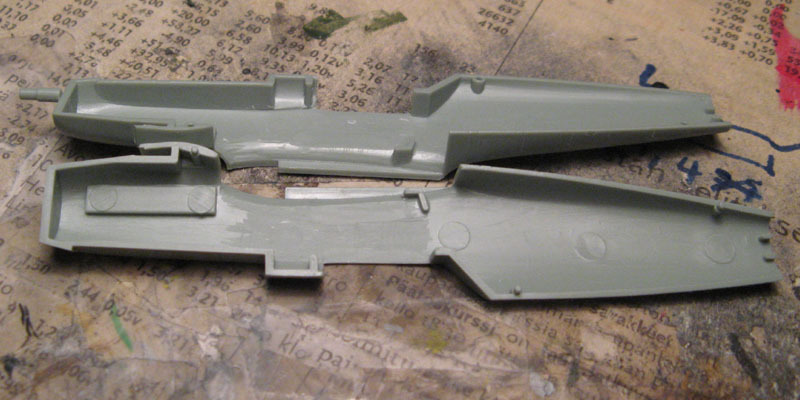 And here's the cockpit components,almost ready for priming as well. I know, I messed up the chain going to the flap control wheels. I managed to glue the chain pointing to the wrong side, and I didn't feel like taking the finished component apart to fix it, so I just attached to the cockpit floor the wrong way. 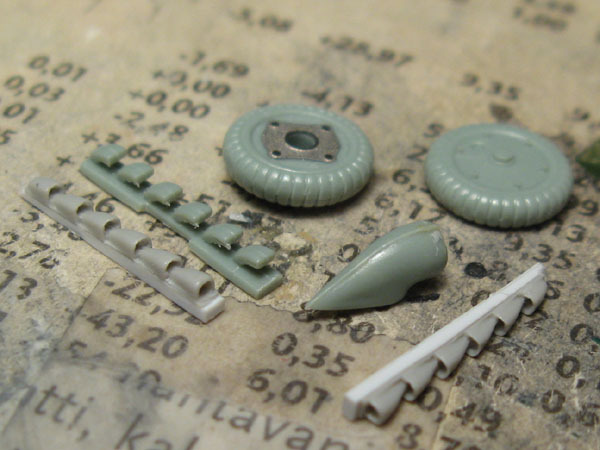 The Revi 16 gunsight is already there, unpainted and without its glass. No big modifications here. I only sanded down the sides of the seat and added a button to the control stick. ps. Btw, school's out already for me, meaning much more time to build. I should be concentrating on my Blenheim as well, as Twin Spinners' deadline is at the end of next month. I think you already did a fantastic job on that camouflage. There's not much to improve! It's the first time I used Promodeller's wash and I must say it does work. I think the product is only composed of some pigments mixed with water but if you look for a ready to use product you can go for it. I know I will use it again in the future. 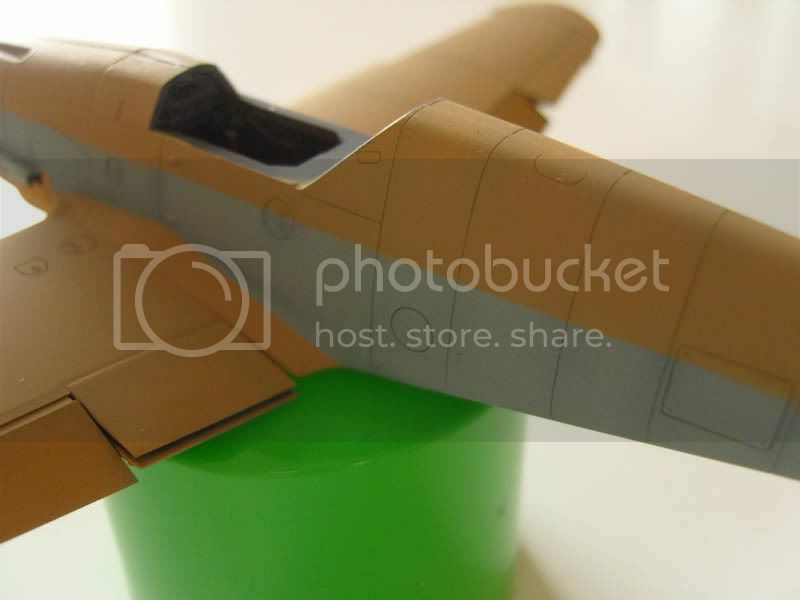 I made a small diorama to go with Kozhedub's aircraft. It is composed of a soviet style base by Mark58, a Zis-5 Fuel Truck by Tarmac (French resin kit), a Gaz-67 car by Tamiya and some figures by ICM. Nice La7 Jean-Luc. That was one of my possible choices for this campaign as well, but i decided to go WW1 instead. 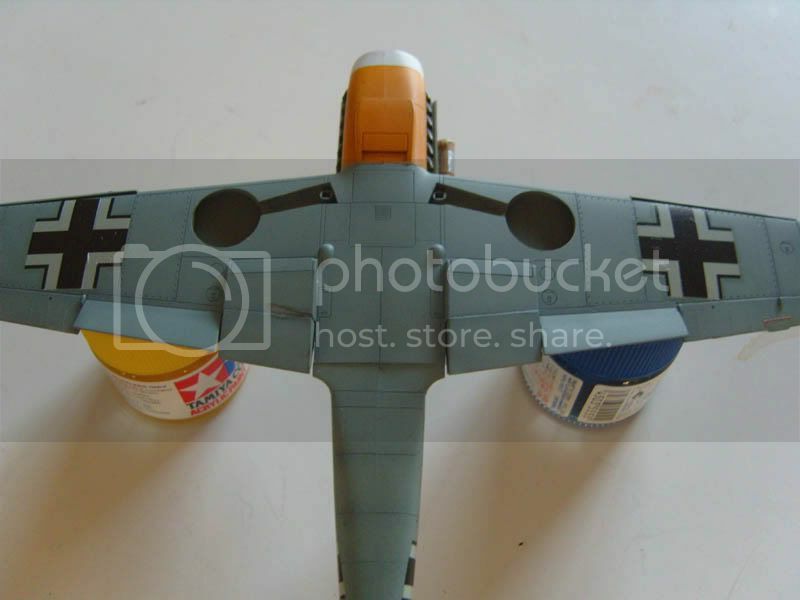 And the Fokkers are done. Like usual i don't weather German WW1 aircraft much, their colour scemes are interesting enough already. First is the last aircraft flown by Karl Bolle. A Fokker DVIIF that was handed over at the armistace, like most of the remains of Jasta Boelcke. Note the two a/c in the pics are in fact different aircraft. The one with the dog was an earlier aircraft, but similarly decorated. Karl Bolle is officially credited with 31 kills, but many sources credit him with 3-4 more than that. Born in Berlin 20June1893. Served first in a cavalry unit, from where he got his traditional colours that decorated his aircraft, yellow/white/black. During his ealier time flying two seaters Bolle's observer was Lothar von Richthofen. Bolle was noted as being a good leader, and lead Jasta Boelcke from early in 1918 until the wars end. He had 20 kills to his credit when the until began using the DVII's. Post war Bolle held positions in flying training and advisor to the fledgling Luftwaffe. He also survived WW2 and died in 1955. 1/6 JJ Models Sarah "Gothic"
Most people know of Bruno Loerzer and his black and white aircraft. His early carreer saw him flying 2 seaters just like most other pilots of the time. His observer being none other than Herman Goering. 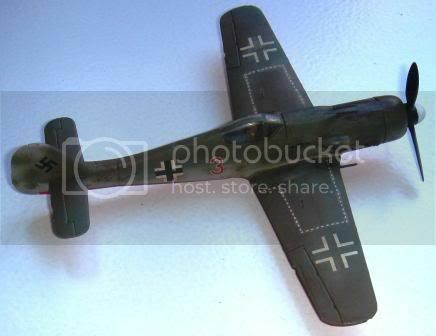 Credited with 44 kills, his scoring rate fell off towards the wars final months, despite using the BMW powered Fokkers. Though much of his time was probably being taken witht the responsibility of leading JGIII. Loerzer also held staff positions in the Luftwaffe during WW2 and survived that conflict as well. He died in 1960. I chose to do the early Fokker built aircraft that Loerzer flew. It was decorated in the black and white stripes of his earlier Jasta 26. The upper wing top and lower wing undersides were also striped to identify the leaders aircraft. And now there are six of the Fokkers! 3 Roden, 3 Eduard. All aces aircraft except for one. "..Often, these veterans were hard work because, as was going to become apparent during the Second World war, the capacities of a fighter pilot diminish with time; in two years, performance can decrease appreciably. I experienced this directly when I had to retrain Oberst Bruno Loerzer. With 44 victories, he was one of the most successful pilots of the First World War, decorated with the 'Pour Le Merite' and a personal friend of Hermann Göring. However he was forty-five years old at the time - an old man. This helped neither of us because I had to turn him into a fighter pilot! We ensconced him in a flying suit and hoisted him into the cockpit of an Arado 65 to fly a mock combat. From the first turn and without the least problem, I found myself on his tail and in position to shoot him down. To tell the truth I felt some regret at treating him like this - he had after all been a hero. So I manoeuvred lazily and let him in turn come around on my tail so that he could win the duel. This way I wouldn't have to let him down.."
Note the seven victory bars on the tail and the ladybird emblem from ZG 76 under the cockpit. Ordinarily Falck's a/c should have been coded 'AA' but 'G' was the initial of his girlfriend Gerta. Nigel: Nice to hear you're on the road again. It's just like being a racing mechanic It's a mess when you're in it, but you miss it when you're away. Looking forward to the rest of the bolt! Magnus: I understood my intakes won't fit your small bird, but it's looking gooood! A few markings and some wheathering can make this beautiful, and even more since you have shown the efforts to get here. Jean-Luc: Keep testing methods, and thanks a load for showing pics from the steps between that you seldom see. It's a lot easier to dare when you've seen how it can look along the road. 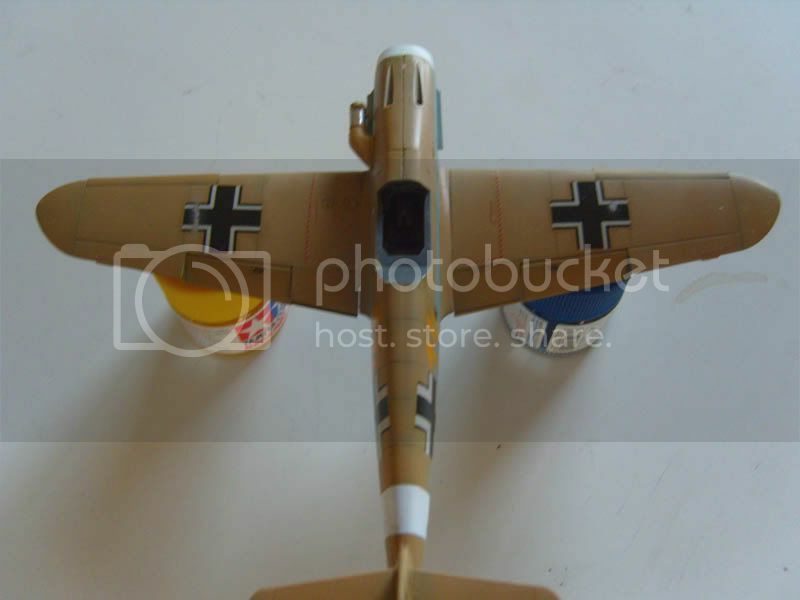 Andrew: Nice Fokkers, both inside the campaign and outside. Even though the "camo" is a bit suicidal, it sure provides some extravagant pieces in the cabinet. Neil: Beasty black 110. Nice with a little history too. And for myself I got a bit further with Marseilles 109 F. I thinned the flat varnish with red spirit. Same juice you use in caming stoves, and it turned out great. Now I'm in the middle of stenciling, and it drives me nuts. At 1/2 hour a day (so I don't crack up) I'll be finished by july . Excellent work, Jean-Luc, Andrew, and Neil! Andrew, great collection you have there. They are a stunning display and with all those colours it will also be very interesting for people not normally interested in modelling or aviation. Neil, thanks for sharing the little bit of history and background about your ace. Great work on the camouflage, Magnus. Especially considering the scale. Looking forward to see it finished. Neil, nice 110 and interesting history for an aircraft that finally found it's role. Andrew, great Fokkers and SIX of them including Udet's. The Nieuport progresses with aileron controls, undercarriage and wing rigging complete. Since I build only redstars aircraft special kudos to Jean-Luc. I've read in Master 194 that you removed 1 mm from the oleo legs. Would you care to elaborate ob how you've done it. I've separated the gear legs at the bottom of the oleos. Then I drilled a hole 1 mm inside the gear leg and glued the two pieces together with CA glue. This way the legs are still strong enough to hold the weight of the model. You visit Master194 as well? Do you have the same callsign there? Magnus: I've soon got you a wing man. A bit too big, a bit too brown but from the same family, at least. Now it's marking time. 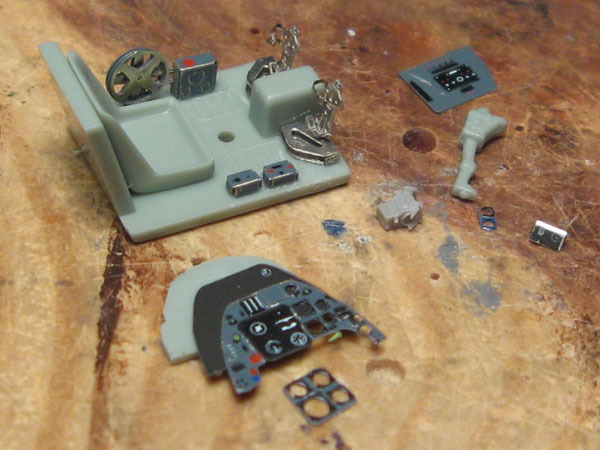 Jeeezuz, the amount of small itsy-bitsy pieces! Most of it is there, but if I forgot something, I don't care. Unfortunately I broke one of the radiators outlets, and fumbled while refitting, so the glue solved some of the paint. I hope I can mask and respray that. Got a bit of the same topside where the balkenkreutzer are scratched. I tried to touch that up with some metal, but I'll have to wheater heavily over that. Anyway. I got the "door closed"-markings on, so I'm quite satisfied. 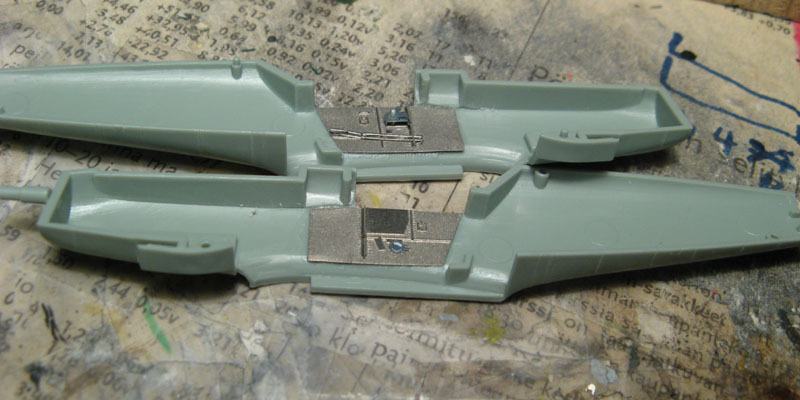 I even realized that I had to separate the 1-9 numbers on the port bottom fuselage before dipping them, so maybe I should buy a lottery ticket. I would have been impossible to cut them wet. So far so good. Time for a flat coat and some washes. Maybe she's ready before july after all. Now, what am I doing wrong. I've apparently forgot which link to use. Is it the "url" or the "url=" I'm supposed to use? Is it the "url" or the "url=" I'm supposed to use? Neither. Both url-links make clickable links. Url just makes the address clickable, url= lets you define the name of the link shown handy if the address is excessively long etc, or you just want to make it stylish. So, instead of "www.sdfsdfs.com/sdgkldjfgfdgkdfgndfklnf/dgjsndgjdfng.jpg", you can have "Link", which leads to the same destination. Img is the one you're looking for, it shows pictures behind the link. You can just modify your post and replace url with img and they should work. Im amazed at the progress over the last few days. Well done everyone,fabulous entries each and everyone of them. One thing I like about this campaign is that entries are eligible from over almost the entire history of flight,well,the parts when pilots have been shooting at each other anyway. Whos going to be the first Ace of the Jet Age? Im back off tour for now but only around for a couple of days before the next job. I'll get the table updated and check the galllery. 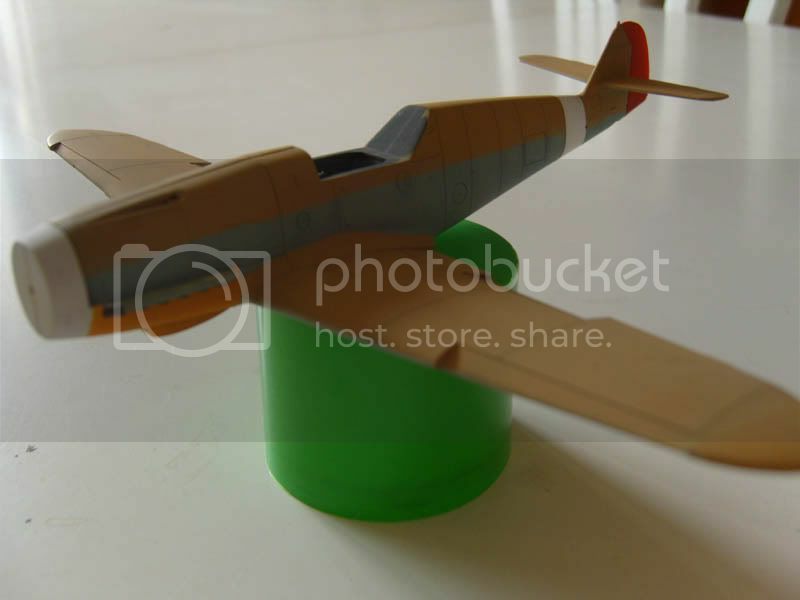 If you havent posted your photos in there already please do so, and dont forget to upload a photo of the actual aircraft. Neil, your photos of the model on the book with the photos behind qualify, but if possible could you scan one and post it seperately? Dont worry if you cant though. The gallery can be found here. Then I removed the masking from the cockpit only to discover that the new masking fluid I have been using let some paint get through. Carefully I tried to remove the paint and polish the clazing. No luck with that - the cockpit is very mat and milky now. The hobby is supposed to be fun and this kit has turned into something that is not fun and something I will never be satisfied with. So it has gone flaming down into the spares box. "Red 23" Heinz Bar's "red 23" was the aircraft in which he scored his 200th victory. "White 11" The aircraft was flown by Gefreiter Walter Wagner. He was forced to make an emergency landing at St. Trond airfield in Belgium due to flak damage sustained in "Operation Bodenplatte" on 1 January, 1945. Great builds so far. I am really enjoying this campaign. That's a shame about the 190 Jesper, the camo scheme looked really well done. My Hellcat is now awaiting Mal's Miracle masks to arrive, so I can complete it. The state of play so far. 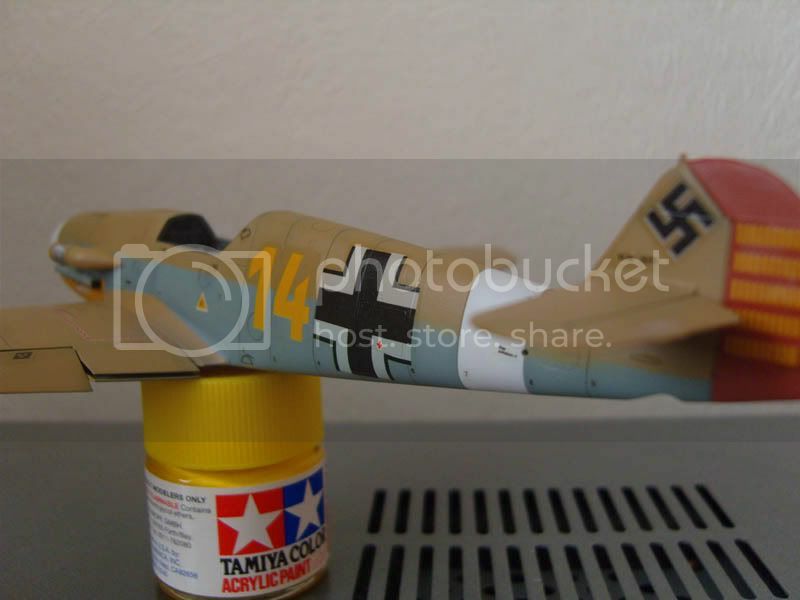 The paints used were Tamiya X-3 Royal Blue uppers, WEM USN Intermediate Blue sides and WEM Non Specular White lowers. Now having just got a new compressor, I am seriously thinking of doing a 3rd build for the campaign, something German and mottled springs to mind. 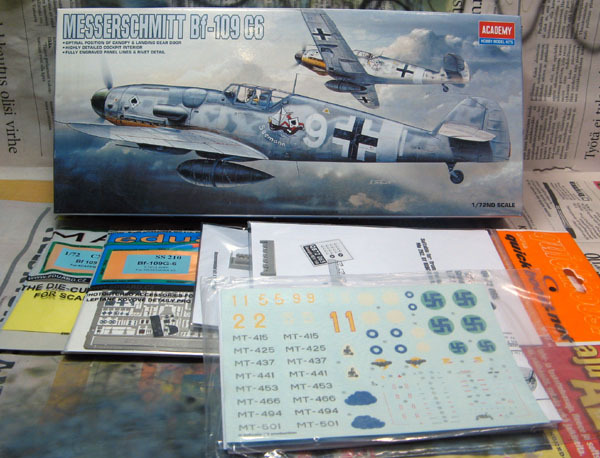 Well hopefully I'll get to start on my first aircraft kit in about 12 years over the weekend. 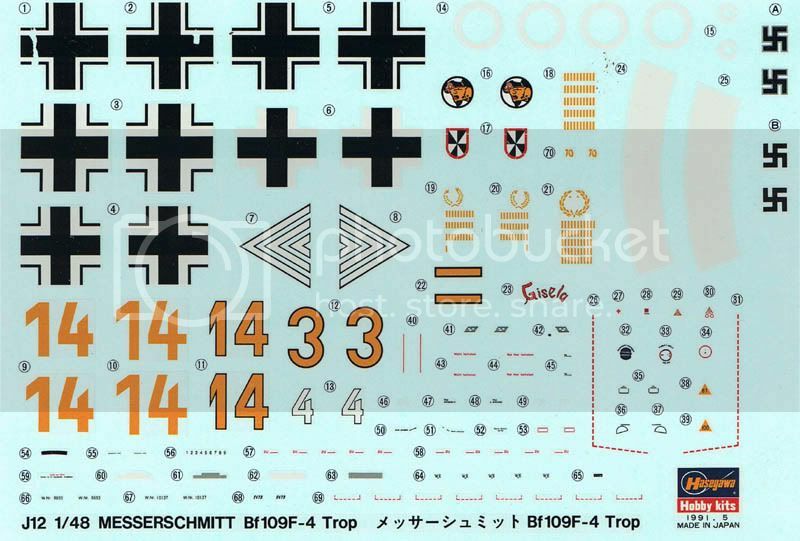 I may be being a bit too ambitious, but I'm planning on building Hasegawa's 1/48 F-16A Adversary fighter with the Israeli "Netz" conversion equipment and Israeli decals. I still have quite a bit of research to do on the subject, but currently I'm planning on building Amir Nachumi's bird, which I believe in '92 displayed 7 Syrian markings and the "operation opera" badge gained when he led the second formation of F-16A's on the raid against the Iraqi Nuclear Plant. I will update with progress as I go along. Both cite him with 81 kills, unfortunately not much more in the way of info.